It's again made by Olivetti, it's again a wordprocessor system, but it's even more strange than the wordprocessors ETV 260, ETV 2700 and ETV 4000s. Those are "integrated" systems where you have one box which integrates the DOS-PC (in case of ETV 4000s it's even Windows 3.0) and the printer (in case of ETV 4000s it's a thermotransfer printer, the other have daisywheel printers), plus an extrnal monitor. ETV 260 has an external PC style keyboard (same as Olivetti M19 PC), for the others it's attached to the system itself. The one I got now is called Olivetti ETV 2900. So it's from the same series, but it's design is quite different while it uses almost the same software as ETV 2700. The PC system is integrated into the monitor and has two 720 kB floppy drives. As far as I know no harddisk option. If you know Olivetti's PCs of 1989, you immediatelly see, that the ETV 2900 is just the slim upper part of an M200 PC. The M200 additionally has a large box beneath the floppy drives and offers some ISA slots. The processor is a NEC V40 and and it has 256 kB RAM what is enough for the special wordprocessor software, but it should be extendable to 768 kB. Until here nothing special. So here it comes, the description misses the keyboard and the printer of the wordprocessor system. So, there is a cable, plugged into the DIN keyboard connector of the ETV 2900 system. The other end of the cable is plugged into ... an Olivetti ET 2200 office typewriter with optional ETV kit. So, yes, the keyboard of the typewriter is the ETV 2900's keyboard, and the system prints over the keyboard interface with the daisywheel printer of the typewriter. Ever before have seen a PC which prints over the keyboard interface ??? The concept of this is very similar to the oldest system of the ETV series, the ETV 300 from 1982, but that one was based on CP/M, and the typewriter was connected over serial interface. Since about two weeks I also have one of these rare systems, unfortunatelly the typewriter of this one has power supply problem, I need to fix this, the wordprocessor box boots from disk and requests for connection to the typewriter..
Last edited by 1ST1; October 8th, 2017 at 01:19 AM. Ok, one more... Olivetti Editor 100. Olivetti Editor originally is electromechanical typewriter of the 1960/70's, very fast and reliable where the top model Editor 5 had proportinal spacing, carbon ribbon and the possibility to write justified text (writing every line two times, first time with a counter for spaces go up, and in the 2nd time that counter counted backwards to tell you how much micro spaces you have to insert between the words). Editor 100 from 1990/91 wanted to take up that traditional name for very successfull Editor series for a new video typewriter model. The concept was very interesting but too late. It was using the NEC V40 processor again, with 768 kB RAM two 720 kb floppies or one floppy plus 20 MB harddisk. The printer uses thermo trasfer print head with ribbons to print on standard paper. Computer, floppys (or harddisk) and printer are integrated into one typewriter looking chassis. It even has two ISA slot at the rear side with exit to the left, strange for a thing which is concepted as a just wordprocessor. But so, I would be able to insert an XT-IDE-controller. The keyboard is not that good as on other ETV series systems, it is bending while you write. The Editor 100 is using the same external monitor as ETV 2700, black&white (greyscale) CGA through composite video cable which could be mounted on an arm which you can fix on the desk. 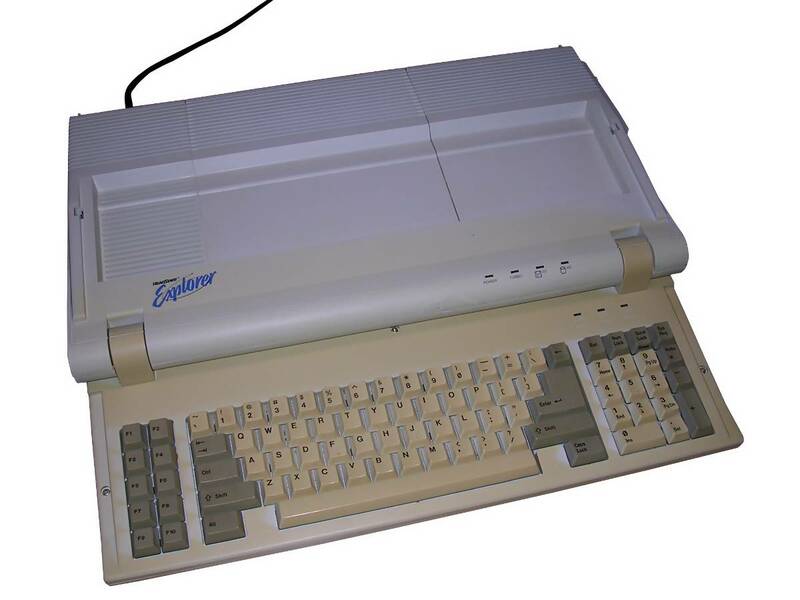 The operating system of Editor 100 was MS-DOS 3.20 (Olivetti branded) like on ETV 2700, ETV 2900 but a from them different a word processor software. This software was similar to the previous model of semi professional type video typewriters, Olivetti CWP-1 (CP/M based in ROM), quite easy to use with a lot of function on the F-keys and the monitor display the current meanings of the F-keys at the lower border. I have nit checked yet how compatible this software is to documents written on the ETV series and CWP-1, but I saw that it can include b&w graphics into the documents. My example of Editor 100 is "new old stock", I was the first person to unpack it since 27 years,since it has been produced. But I had to readjust the monitor and to fix the diskettes, they were mostly unreadable for the Editor. But I was able to make working copies using my Atari STacy with FCopy Pro III and Xcopy nibble mode on Amiga for some bad tracks. Last edited by 1ST1; January 24th, 2018 at 12:03 PM. Do you think these are strange? I don't, but they sure are hard to work on. The membrane keyboard is plugged into the keyboard port on these. I have to add, that since a few days, I have Olivetti ETV 2900 (1st above) brother, the Olivetti M200 Personal Computer. If you compare ETV 2900 and M200 you will find similarity in design, the upper part of M200 is the same as ETV 2900. M200 adds a box with 2 ISA slots and 30 MB RLL harddrive and has standard keyboard instead of a typewriter. A nice little NEC V40 based XT, 768 kB RAM, CGA monochrome (with OGC mode, 640x400 like M24), RLL 30 MB harddrive, very silent. Maintenance is difficult, to open the case you need to turn the whole machine upside down. Then you can open two screws to separate the upper part which consists of monitor, mainboard and floppy drives (the MS-DOS-iMac, same as ETV 2900), or with three different screws you can open the bottom of the box case and get access to the harddisk and ISA slots. If you want strange, check out my Zaisan. It has an 8088, z80, and 6805. Not that it can use them at the same time, the 8088 is for dos, the 6805 I think is for the organizer program in rom, and the z80 is for terminal emulation. That Zaisan is also nice. Has it phone included? What a bunch of obscure computers never heard of this models before, so cool. Vendex Headstart Explorer -- like the Amstrad PPC luggable, except without the built-in LCD or battery pack. The keyboard folds up into the top of the case. It came with its own unique GUI. Zenith eaZy PC - another integrated NEC V40 based system, similar to the Philips machines shown above.